Johnathan Dane [Twitter] has only been in the PPC world for five years, but in that time, he has built two different multi-million dollar agencies. In fact, his current agency, KlientBoost, hit $100k in monthly recurring revenue (MRR) in their first year of doing business. They have so much demand for their services that they had to institute a waiting list for prospective clients. While that growth is impressive, the story alone won’t help your agency grow. You need something actionable. 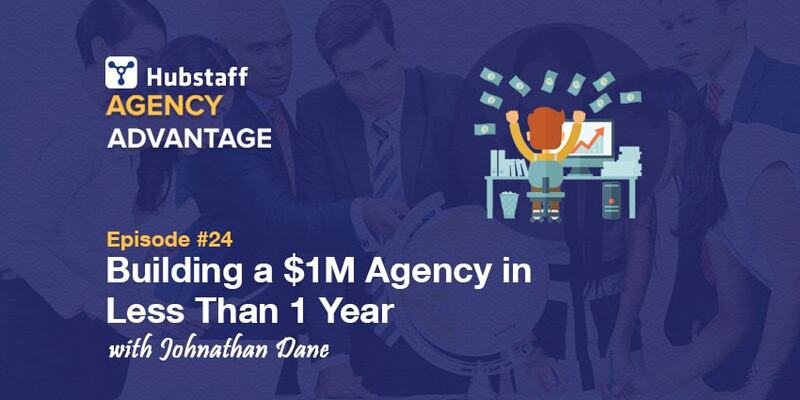 Luckily for you, in this episode of the Agency Advantage Podcast, Johnathan breaks down the steps he took to build a brand that gets five new leads a day, the process he uses to hire and train his employees to ensure great results for his clients, and how he cultivates a relationship with his clients to keep them for the long haul. If you’re struggling to find clients in what seems like a saturated market, then Johnathan’s lessons are going to help you stand out from the crowd. When it comes to marketing, most digital agencies just go through the motions. They all have similar websites that say similar things and offer similar services. Johnathan wanted KlientBoost’s website to be different and make a strong first impression. When you visit their site, you immediately get a feel for their personality, shown with great testimonials and professional photos (instead of the same stock photos everybody else uses). In short, their website shows you that they care. Beyond their website, KlientBoost does PPC differently. Instead of just focusing on sending clients clicks, they know that for their clients to be successful, they need to make sure to perform in three areas: traffic, conversions, and sales. Focusing on the client’s bottom line shows that you truly care about your client’s business, makes them more successful, and enables them to continue paying you for years to come. Although their growth rapidly accelerated, it took a lot of experimentation before Johnathan and his team were able to really nail things down. In the beginning, they were paying $300+ an article to have guest authors post on their blog, but it didn’t move the needle until they hired somebody to promote the content on their blog. While that helped them build an audience, what really drove their results was frequent guest posting on industry blogs, especially Unbounce. By putting out content that actually provided value (instead of just regurgitating the same only cliche articles), Johnathan was able to get more opportunities. He went on podcasts, hosted webinars, and even spoke at conferences. By focusing intently on his content, he was able to build an audience of people who trust him. And when people trust you, sales become much, easier. An additional thing to note is that Johnathan didn’t get bogged down by making sure everything was perfect. He didn’t build any lead magnets or autoresponders to systematically move his readers back into his own ecosystem. Instead, he just focused on created great content, and the results followed. Once you can reliably find clients, hiring and managing employees are two of the biggest pains agencies experience. In fact, it’s the reason that so many agencies decide to stay small; they just don’t want to deal with it. Johnathan realized early on that he could just be a solo consultant and make good money, but he hit his ceiling and knew he could do more. To help tackle the problem of finding skilled employees, Johnathan focused on building an extensive training program to get new hires up to speed. All he cares about are the soft skills, the rest can be trained. Johnathan rapidly grew his team to 14 employees at the time of this podcast. However, the biggest challenge he is facing is that because he didn’t know how fast he would have to hire, he didn’t have a pipeline of relationships he could tap into to quickly find new employees. This is something Marcus Blankenship discussed the importance of in an earlier episode: Build a network of potential employees so that you don’t kill your momentum by not being able to hire quickly enough. Many of the markets that agencies operate in have minimal barriers to entry. If you want to stand out without niching down, you need to build a brand, and content is the best way to do that. Content doesn’t have to be a blog, either. It can be a Youtube channel, Snapchat, or wherever your clients hang out and you can build an audience. Build your brand by putting out content better than your competition and you are going to stand out from all of the generic agencies out there. If you’re a marketing agency, you need to start by learning how to market yourself. If you want to hear more of what Johnathan has to say, you can follow him on Twitter and check out KlientBoost’s blog. They also just released a post going into greater detail on how they managed to hit $100k MRR so quickly. And if you want some of the best resources out there on PPC and CRO, check out their resource page for ebooks, webinars, podcasts, and more. Do you just try to deliver what the client is asking for, or do you go the next step and make sure what you delivering will actually help their business? What sort of impact has making that transition had on your agency? I’d love to hear your story in the comments below. Canopus Infosystems is one of the many full-service IT and development agency based in India that finds Hubstaff integral to their business. We were lucky enough to have a chat with a Canopus representative to learn how they run their business and hear their plans for more than doubling in size in the next year….